Your kids are going to love it. With this product, your kids can bake little cakes and then decorate them making animal faces or other such cite designs. It keeps them occupied, happy and more importantly they eat healthy, home baked stuff. It is extremely convenient to bake these mini pop cakes. The baking tray has multiple molds with a non-stick coating. So, you can put any cake mixture into the molds, place it in your oven and they will come out as solid and clear pop cakes. No messy edges or sticky crumbs, instead a clear pop cake. There are just so many things you can do with these pop cakes- they are perfect for a birthday party or as Christmas gifts or simply as desserts. And the best part is that you don’t have to spend money in expensive bakeries, you can make your very own fancy looking pop cakes. Another great feature about the pop cakes is their size. If you are dieting and you feel the compelling urge to eat something sweet, these pop cakes are just the perfect size of serving. They will satisfy your temptation without adding the extra pounds. Think of baking and you instantly picture a messy kitchen, sticky baking trays, lots of dirty knives and spoons. But now, you can say goodbye to all these hassles. You just have to put pop cakes on a stick and decorate them in whatever way you want. After you are done, you can put the baking tray in your dishwasher like any other utensil. 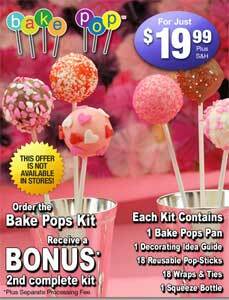 All said done, the Bake Pops is wonderful and innovative product that will keep your family happy and satisfied. It’s time to switch to these cute little cakes on sticks and forget about boring cake slices.